A strange hush descends. You have the feeling that everyone around you is sitting very still when the renowned Norwegian saxophonist Jan Garbarek emerges from behind a stone column in Temple Church and makes his first utterance on his tiny curved soprano saxophone. You can’t help but close your eyes to let its reverberant cadence wash over you, and it’s only then that you become aware of celestial voices at the edge of your consciousness, arriving seemingly out of nowhere. 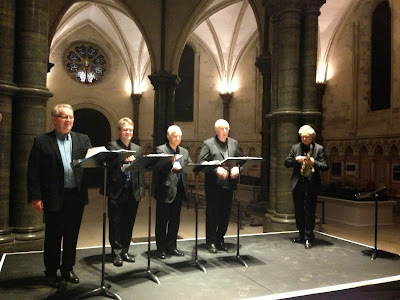 Slowly you realize it’s the four male singers that comprise the Hilliard Ensemble, who are moving through the aisles, to converge on the small platform in the centre of the nave. Now in their 40th year, this concert is part of the Ensemble’s goodbye tour, during which they have performed their repertoire with Garbarek all over Europe in many different sacred spaces with incredible acoustics. Knowing it’s their swansong lends what is already a highly charged emotional experience an additional poignancy, and might help explain the extraordinary attentiveness of the audience; you have the sense that no-one wants to miss a single note. The pairing of a vocal chamber ensemble with a jazz musician might sound an unlikely combination, but it was the inspired brainchild of ECM’s founder Manfred Eicher. In 1993 he brought the five of them to an Benedictine monastery deep in the Austrian Alps, and first tried out this extraordinary combined sound, little knowing it would be one of ECM’s biggest success stories. Officium was released in 1994 to great critical acclaim and has since sold over 1.5 million copies. They followed this with two other albums, Mnemosyne in 1999 and Officium Novum in 2010. Often attracting epithets like ‘esoteric’ and ‘ethereal’ – terms which in a sense have come to define the ECM label – Garbarek and the Hilliard Ensemble’s choice and treatment of material is, to my mind, more ‘eclectic’ than anything else. They have rearranged Plainsong, old English folk songs, renaissance secular music, Spanish funeral music, compositions by the Armenian monk Komitas and also work by Estonian composer Arvo Pärt. They have set poems by Swedish poet Pär Lagerkvist to music, as well as worked with compositions by Garbarek himself. The end result is a highly consistent blend of choral works with a strong minor or modal tonality, to which the group applies unusual humility and restraint and produces something that’s not far short of perfection. The four voices, David James (countertenor), Rogers Covey-Crump (tenor), Steven Harrold (tenor) and Gordon Jones (baritone), are so in tune and in synch with each other at times it’s quite unreal; you can hear all the possible harmonic overtones. Usually alluded to as the ‘fifth voice’, Garbarek’s contribution to the sound functions in several different ways depending on the piece. At times he adds a decorative motif in the form of a wildly angelic soprano line, sometimes it’s a firm rhythmic counterpoint in a canon, sometimes more typically in a jazz idiom working as a game of call-and-response, and on occasions he makes an opening statement upon which the quartet then elaborates. Whatever his role, Garbarek often leads the voicings into a darker more austere harmony, making exhilarating lines from obscure but captivating scale choices. Their performance of Holy Mother of God was particularly mesmerising. At times something else emerged from their combined sound that was like a low, ululating resonant interplay, feeding off the fabric of the building. What can I say? It was a quite extraordinary and, dare I say it, transcendent experience. Very beautiful sounds. Jan Garbarek’s soprano saxophone sounded at times like a flute, at times like a shakuhachi, with Japanese or other Eastern scales. At other times, it sounded more Arabic. The Hilliard Ensemble’s ululations sounded Tibetan as they walked in through the audience, and wound their way out again at the end. This contrasted with their heavenly harmonies from the 16th century. The Temple Church’s acoustics and ambience were perfect for the occasion.